BECOME A PART OF THIS SAFER SOLUTIONS MOVEMENT!!! Transition to safer. Use the EWG site or app to see where your products stand. If what you love works AND is safe, wonderful- keep using it! If not, swap to something better. – Receive free shipping off all orders of $100 or more… yes please. WOOOHOOOOO! – Receive a special gift just for signing up- lots of goodies! – Special offers and promos just for you! Confirm that “Cindy Sexton” is listed as your mentor… I’ll help with questions, offer support, and share our special promos with you too. If you’d like to help us spread the word, you can host a social! ARE YOU PASSIONATE ABOUT OUR MISSION AND WANT TO SPREAD THE WORD? By doing so, you will automatically save 25% off your own orders, and take advantage of the opportunity to earn some additional income while educating others too. It’s honestly such a fun and rewarding gig! There’s so much flexibility to make it whatever you want it be. Some consultants earn a full time income, while others do it on the side to share their passions and make a few extra bucks while helping spread the mission. It’s totally up to you how you do things- whether it’s 5 hours a month or 50. We are a direct retail company, not an MLM. We do not require that you spend a minimum amount on products every month, and we can be used an affiliate program too. We have a low start-up fee of $85 (which you’ll earn right back!). This is the right time to join Beautycounter! We are growing so fast… it seems everywhere I turn, I see people excited about what we’re doing. This issue is finally getting attention- we’re at the forefront of something really great here! My team and I will support and coach you every step of the way… ???? Click HERE to join as a consultant. Enter your email and other required info to create your account. Make sure that my name -> Cindy Sexton – is listed as your mentor so I can help you along the way. The Business Kit comes with your enrollment fee- it contains all the bare essentials to get started. You can also add one of the discounted collections to your shopping cart if you choose. Finish the enrollment page and place your order. That’s it! Hi, I’m Cindy! I’m a teacher, wife, aunt, health and fitness enthusiast, blogger, food-lover, and most recently, safe skin care gal too. This is the story of how I fell in love with a mission called Beautycounter. It’s a mission you deserve to hear about. We all do. My Story: Like many of you, I have spent years caring about what I eat and put in my body… I care about what I eat. Heck, so much so that I started this food blog back in 2009, as a way to share my inspiration with YOU! All those years though, I failed to pay attention to what I put ON my body. I had no idea that daily, I was compromising my health by smothering toxic chemicals all over my skin- my biggest organ of all! I hadn’t considered that what I put on my body mattered too. It wasn’t until a couple of years ago, when I read an article about sunblocks released by the Environmental Working Group (a non-profit organization that specializes in food and cosmetic safety), that I realized I needed to be more mindful. I was absolutely shocked to learn that the sunblock I’d been wearing for years was one of THE most toxic out there. I thought I’d been choosing wisely…. but alas, I’d been slathering harmful poisons all over my body for years, and didn’t even know it! What else had I been duped by? The Truth: When it comes to personal care products, there are minimal regulations. Our beauty industry is self-regulated… the FDA has little authority over what cosmetic companies choose to do or sell. Truth is, companies are allowed to use known toxins—ingredients that have been linked to cancer, reproductive issues, and hormone disruption—without disclosure. And it’s happening every single days, right before our eyes. This is why part of my mission is to dig around and educate myself, as to ingredients are actually going into the products I use. 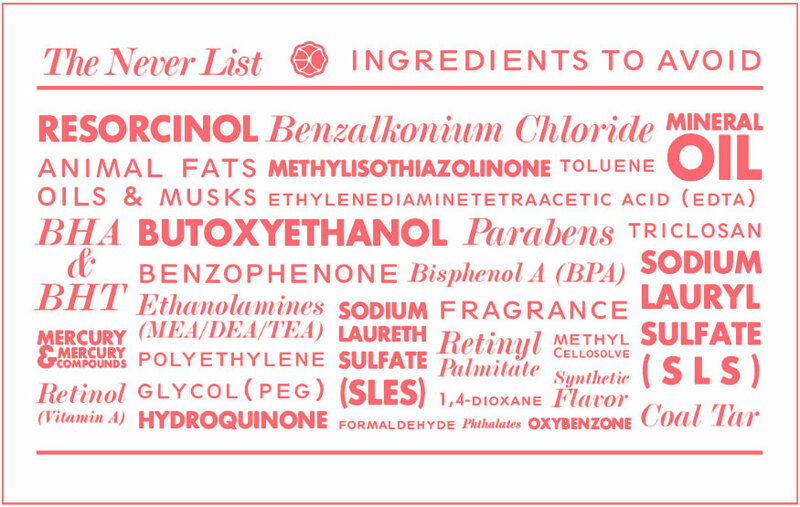 At Beautycounter, they have created a ‘NEVER LIST’ that highlights the major ingredients which will NOT be included in any of their products. In the United States, the last major law passed by Congress declared a company’s “fragrance” a trade secret- it’s proprietary information. This law allows companies to put up to hundreds of ingredients in their “fragrance” without disclosing them. Anything can be in a “fragrance” – chemicals to mask smells, toxins, preservatives, you name it. If it was indeed just a fragrance- say rose petals or orange peel oil- why wouldn’t they just say that? You can explore more if you’d like on the FDA’s site. While this information may feel depressing and debilitating, there’s actually a big positive here. When we know more, we can do more. Knowledge truly is power. Now that we know this, we can do something about it. Yep, you read that right- 1938! 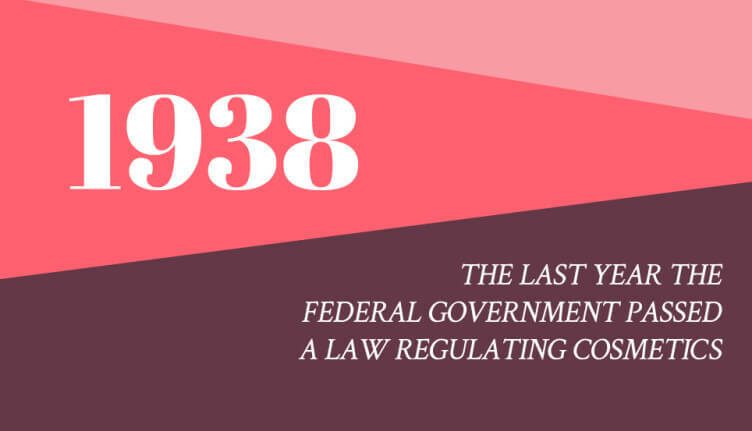 When talking about regulations in the US – that’s over 75 years ago… before WWII!! Comparatively, in the European Union, for example, they have banned 1,400 ingredients from all personal care products. The United States has only banned 11. Within Canada, they have banned somewhere between 600 and 700. While HERE in CANADA, we are a little bit more progressive than the US, we are still majorly lagging, compared to where the EU is. Beautycounter has banned over 1500. Think about what you put on your skin every day – deodorant, shaving cream, soap, shampoo, conditioner, foundation, mascara, chapstick, lipstick…and the list goes on! How much do you actually know about them? I didn’t know all that much, until I started looking some of them up on the Environmental Working Group site!!! In March of 2013, a team of women came together to form a grass-roots company that would go against the grain. Gregg Renfrew- founder, Mia Davis- previous head of the Campaign for Safe Cosmetics, and Christy Coleman- celebrity makeup artist on a mission to clean things up, teamed up to bring Gregg’s dream to life. With a name of many meanings, the new company symbolized a place for better beauty products, and more importantly, one that countered the current beauty standards. If you’d asked me a few years ago what I’d be doing today, I never would’ve said working with a skin care and cosmetics company. I’m an elementary physical education teacher… I knew nothing about the cosmetic world. Yet today, here I stand, proudly part of the Beautycounter team. I have found the activist in me. I am so passionate about spreading the mission and making sure people are educated about what they’re putting on their bodies.